Introducing the Old Skool Guarantee! We've got your back with our exclusive offer that nobody else in the industry offers. 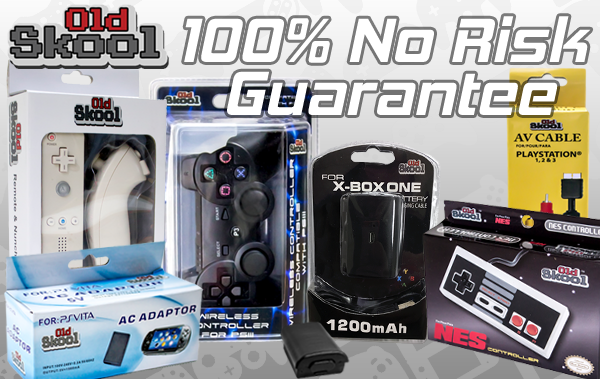 If you have leftover controllers, cables, or any other accessories bought from us that just wont sell, send them back! Or maybe if one color sells better Once we receive them, we will give you 100% of the items value back to you! * How great is that? So great that no other distributor is willing to give this kind of guarantee. Why not pick up the phone and give Video Game Advantage a shot for your next order? We guarantee that you wont regret your decision to partner with us! *Any Old Skool product can be returned for full credit within 180 days, from date of delivery, towards any open invoices you have or your next order of Old Skool product providing that the product is returned in an unopened and sellable condition. For opened or damaged products the normal product warranty applies. For any questions about the Old Skool no risk guarantee please contact your sales representative.